Magician David Copperfield waved his hand over the envelope, which popped open. He wiggled his fingers, and the card slid upward. A moment later we heard the winner’s name: “Scientific American.” The guests at our tables roared with approval. A group of Scientific American colleagues were at the 2011 National Magazine Awards, the Oscars of publishing. The magazine won for General Excellence in the category of “Finance, Technology and Lifestyle Magazines.” The award, bestowed by the American Society of Magazine Editors, was for the September, November and December 2010 issues. The staff worked hard, but we owe special thanks to our readers. You inspire and challenge the editors, art directors and others with your insights, observations, feedback and suggestions. You have high expectations, and we aim to meet them. In this month’s cover story, for instance, “The Limits of Intelligence,” author Douglas Fox explains how the laws of physics may well prevent the human brain from evolving into an ever more powerful thinking machine. Other articles in the issue explore how experts can identify “The Best Medicine” via comparative effectiveness research; what lessons “The Last Great Global Warming” 56 million years ago offers today; and how confounding the “Scent of a Human” for mosquitoes could com­bat malaria. Round­ing out the mix is a feature marking the 100th anniversary of “The Periodic Table of the Cosmos,” which reveals the patterns behind the stellar bestiary. Last, I want to mention two items. First, thanks to the Lawrence Hall of Science in Berkeley, Calif., for inviting me to join them at the White House Easter Egg Roll, which began including family-friendly science activities last year. We built bunny-shaped copters and kites with the kids. 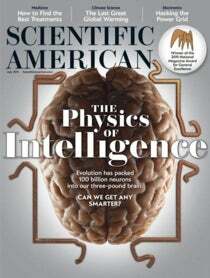 Check out Scientific American’s educational activities at www.ScientificAmerican.com/education. Second, in July the Google Science Fair will announce its first contest winners, which invited entries from students ages 13 to 18. I will be the chief judge and master of ceremonies. Watch us on YouTube and learn more at www.google.com/sciencefair.